Acrocanthosaurus had the most powerful arms of any theropod that ever lived! This dinosaur is considered by most scientists to be the sauropod hunter in the trackway at Glen Rose, Texas. 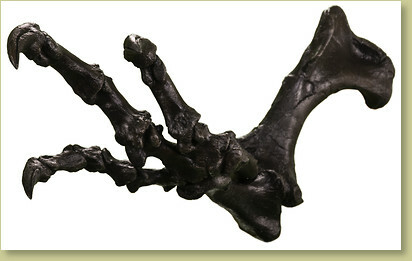 This is a replica cast from the only complete arm from an Acrocanthosaurus. Displayed in a "grabbing pose", all of the muscle and tendon attachments are evident. Can be mounted on an optional steel base. Exhibit alone or with a group of other dinosaur arms. For a suggested group, check out 'Armed and Dangerous' from the "Related Products" links below. Check out the Acrocanthosaurus Interesting Info page for more on this specimen. Credit The original skull and skeleton was prepared by Black Hills Institute and is now on display at the North Carolina Museum of Natural Sciences in Raleigh, NC, USA. Notes May take approximately four weeks for production. Check with us to see if an earlier delivery is possible.